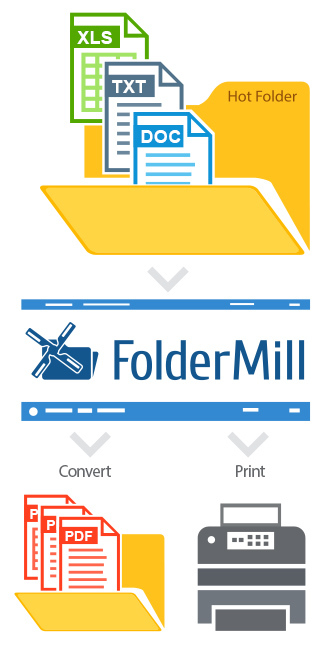 fCoder has released the updated version of FolderMill - server-side software for batch printing all sorts of documentation and converting documents to PDF, JPG, TIFF or PNG formats. This updated version makes use of new algorithms for file printing and file conversion that can be applied on files containing plain text and on PowerPoint presentations. Another improvement is the ability to process Adobe PSD files and Windows Metafiles. Printing documents and creating PDF files are two most popular everyday tasks within the office environment. Each of these tasks is normally solved by each employee individually on his or her own computer. Every user of the PC connected to the printer just needs to open the document, click "Print", specify printing preferences, and click "OK" to print a document. The same approach works for PDF files creation. Normally, users have access to the software able to convert document, presentations, worksheets or drawings to PDF. However, this "individual" procedure works well for small offices and home users, but can be barely applied on large corporations or governmental institutions involving a large number of workers - it turns out to be ineffective. FolderMill software is usually installed on the office server to watch the "hot folders" shared within the network. The hot folder for incoming files follows the rules specified by system administrator, and if the rule is to print the incoming files or convert them to PDF, files will be printed or converted correspondingly. The employees do not need to do much: they just place the documents that need to be printed or converted into the corresponding folder and wait for the result. This idea of shared "hot folders" releases the office workers from installing printer drivers and PDF creation software. Another benefit is that this "hot folders solution" is 100% platform-independent: regardless of the platform of preference - whether it's Windows, Mac, or even Android, to print a document or to convert it to PDF or an image file all the user needs to do is to copy the document to the network folder. The user just needs access to the network shared hot folders. One more advantage is that once configured, FolderMill produces PDF files and prints document following the same settings. For example, all the PDF files can be created in PDF/a format; all text documents can be printed with economical toner settings, and all drawings and charts can be printed on A1 sheets with premium quality. Thanks to the FolderMill, one can save paper, toner, electricity, and time!